Maximise the light your windows let into you home by booking a regular window clean with us. Our teams can clean both the insides and outsides of the windows, leaving you with a spotless view to enjoy. We bring all the equipment to site, including pure water, in our specially equipped vans. As well as residential windows, we also clean conservatories, conservatory roofs, VELUX windows and greenhouses. As standard all of our window cleaning prices include cleaning the window frames and sills at no extra cost. We’re trusted: Our loyal and dedicated staff are trusted by our valued residential customers who allow us access into their homes every day. Family run business: Now in our second generation, for the last 25 years we’ve been working across Devon & Somerset – always providing a quality service. We can clean all types of windows on any premises. Everything from glazing on industrial units to 18th century manor house windows and everything in between. Our client list includes NHS properties, school buildings, churches, housing associations, retail units, offices, public sector buildings and of course residential properties. We love a challenge and can overcome almost all access issues to get your windows clean. Single glazing, double glazing, secondary glazing, leaded windows and delicate stained glass windows – We have the expertise and equipment to clean all types of glass, whatever your window cleaning needs. The frequency of the clean may depend on personal preference or the area your windows are in. We offer daily, weekly, fortnightly, monthly, bimonthly or quarterly cleans as standard or we can tailor a specific cleaning plan to suit you. We’re always happy to offer advice on a window cleaning schedule to suit you and your home. Who will clean my windows? Did you know we can clean windows at heights of up to 65ft from the safety of the ground? Our water fed pole system allows us to provide you with a superior, longer lasting and cost effective alternative to ‘traditional’ window cleaning. 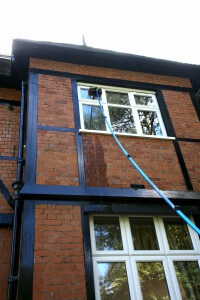 Environmentally friendly and safer for our operatives, the system cleans your windows using pure water. Gentle enough for more precious types of glass, such as stained glass windows and leaded windows the waterfed poles also clean newer style windows faultlessly. Embracing new technology doesn’t mean we’ve lost touch with our traditional roots though. We’re happy to offer either window cleaning method and can advise on the best option for your windows. 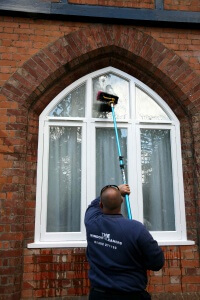 All of our staff are also extremely experienced in using traditional window cleaning methods. This is the technique we use on internal glazing and where necessary, on external glass. Please contact us if you would like to receive a free quotation for you business. Got a question? Please check our residential window cleaning FAQs.